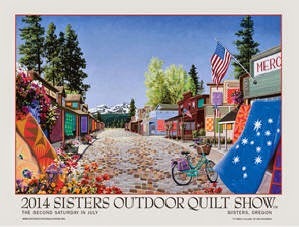 Are you going to the Sisters Outdoor Quilt Show on July 12th? PMQG will have a special exhibit in the show and we need volunteers to be at our exhibit. We need 8 volunteers to work these shifts: 9-11, 11-1, 1-3, and 3-5. There will be a meeting for volunteers 1-2 weeks before the show so you will know what the expectations are. If you would like to sign up for a shift, please email Cris Pera: cp.artisan@gmail.com. There is also still time to enter a quilt in our exhibit! Submission has been extended to May 2. Entries to be sent to Gail at gweiss23@gmail.com with: SISTERS SUBMISSION in the subject line by MAY 2! All entrants will be contacted on MAY 7 to let them know if they will be a part of the special exhibit. Entrants chosen to be in the PMQG special exhibit MUST REGISTER WITH SISTERS by MAY 9th! !